TIP: you can use anything you want for the middle! 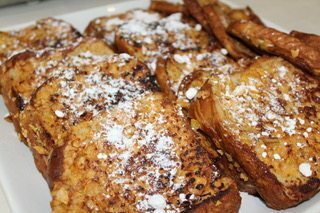 The actual recipe that inspired me was PB&J French toast but one of my kids doesn’t like peanut butter. First, spread the cream cheese and jelly over one side of each piece of bread (cream cheese first then jelly on top). Sandwich 2 pieces of bread together. Sprinkle the crushed cereal on a plate making sure to spread it out. Mix together all ingredients under egg dip. Spray a large skillet with nonstick cooking spray and preheat over medium heat. Dip sandwiches in the egg dip, covering both sides, and then dip in cereal, making sure to cover all the bread. Place in skillet and cook until it is golden brown (approx. 2 min). Flip sandwich and cook on the other side until golden brown (approx. 1 min). serve on a plate and enjoy!!! This is a perfect recipe for a weekend brunch, or make a double recipe and enjoy throughout the week! 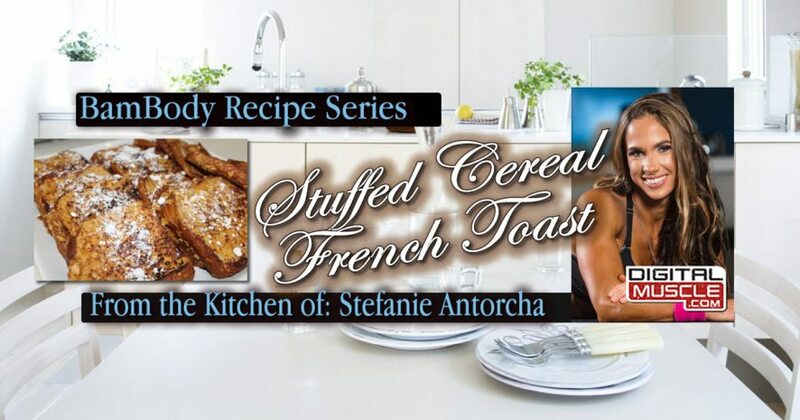 There is never a bad time for stuffed French toast! Till next time Check out my recipe blog here at DigitalMuscle.com!